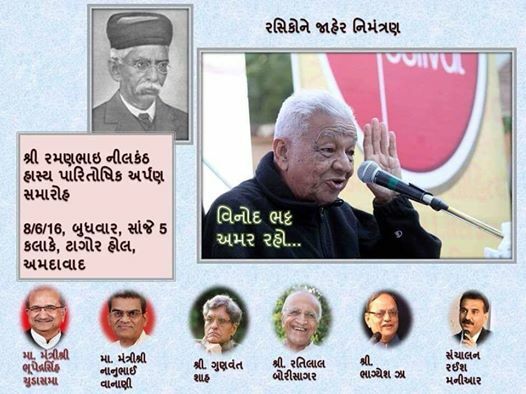 An award function for felicitating veteran humorist Vinod Bhatt where State level ministers like Mr. Bhupendrasinh Chudasama and Mr. Nanubhai Vanani shall be present. Also invited are other literary heavyweights Mr. Gunvant Shah, Mr. Ratilal Borisagar & Mr. Bhagyesh Jha. The session will be conducted by Raish Maniar. This is a great opportunity to show respect to the author who has contributed immensely in form of humour writing to gujarati literature.